Lots going on right now! Over the last couple days I've been wonderfully overwhelmed with Twitter emails helping to promote Dark Divinity, thanks to my most recent author spotlight on Princess of the Light! 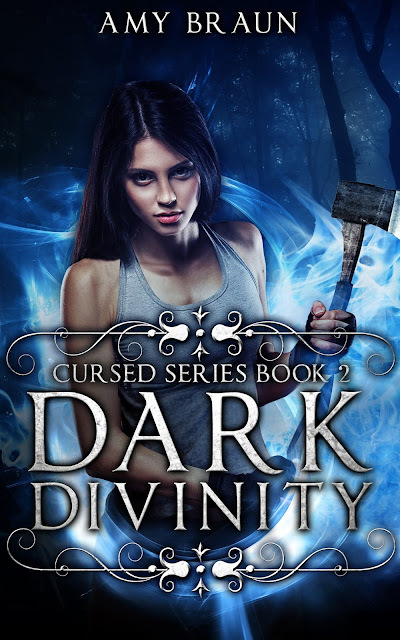 There are still a couple chances to win copies of Dark Divinity on Goodreads and The Bookish Crypt, so hurry in! I'm also super excited to announce that the cover art for Crimson Sky, the first novel in my upcoming Dark Sky trilogy for all you steampunk/horror/dystopia lovers, is nearly complete! I should have everything in the next couple days, and will likely do the reveal as part of my 8Sunday post. It wasn't what I was expecting, but I'm falling in love with it. It's super badass, and definitely memorable. I'm also requesting more cover art and editing services for the final Cursed novel and Storm Born, which basically means that over the holidays I'll be editing up a storm. I got extra time off (because there's no way I'm going to want to edit on Christmas Eve or Christmas Day), so I'm going to take advantage of it to meet all the deadlines I set for myself. I'm getting better at his organizing thing, but it's amazing how quickly time flies! Anyway, that's all the exciting news I have to share. Remember to come back on Sunday for the cover reveal of Crimson Sky! Cheers!